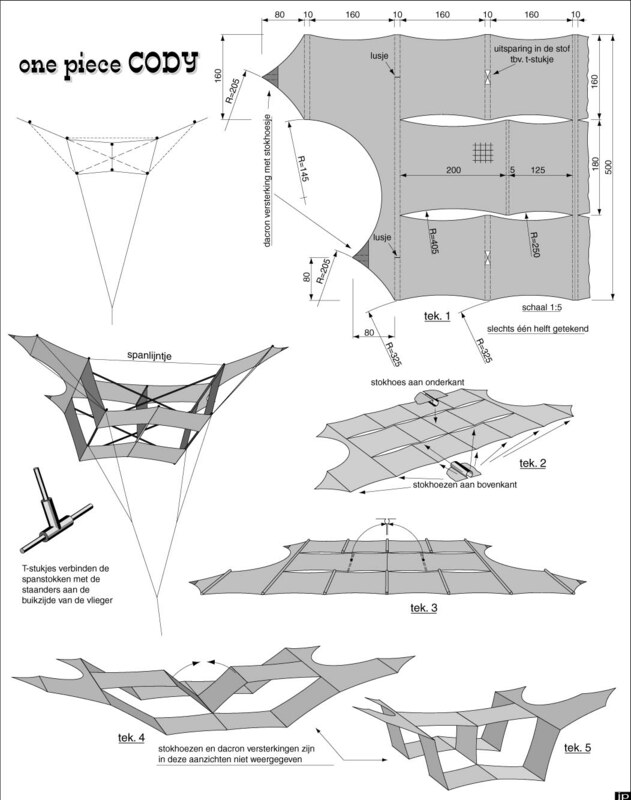 This is yet another kite that I first heard of on the kitebuilder.com forum, in this thread. It looked as if it would work with the 3/4 ounce ripstop nylon that I had on hand, and wood dowels from the hardware store. 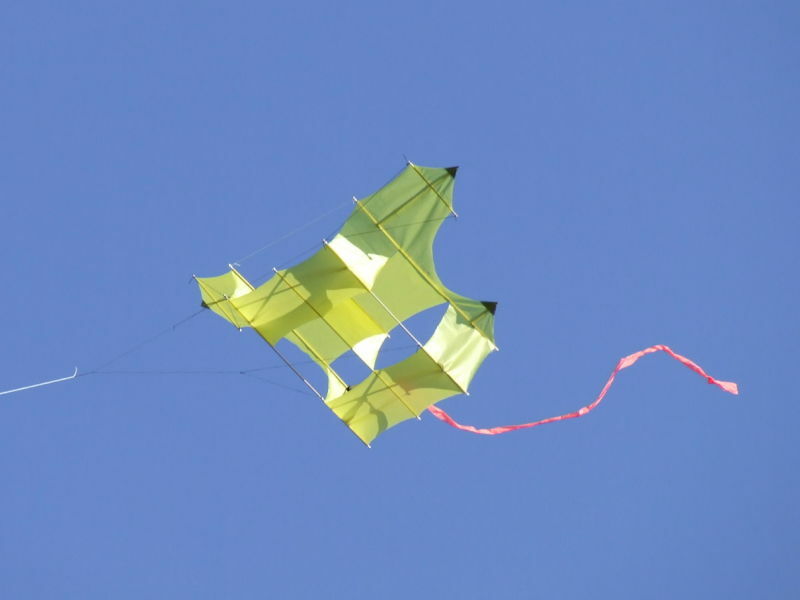 This is my first box kite of any sort. What appealed to me was the "old school" look of the scalloped panels, like a miniature square-rigged sailing vessel. 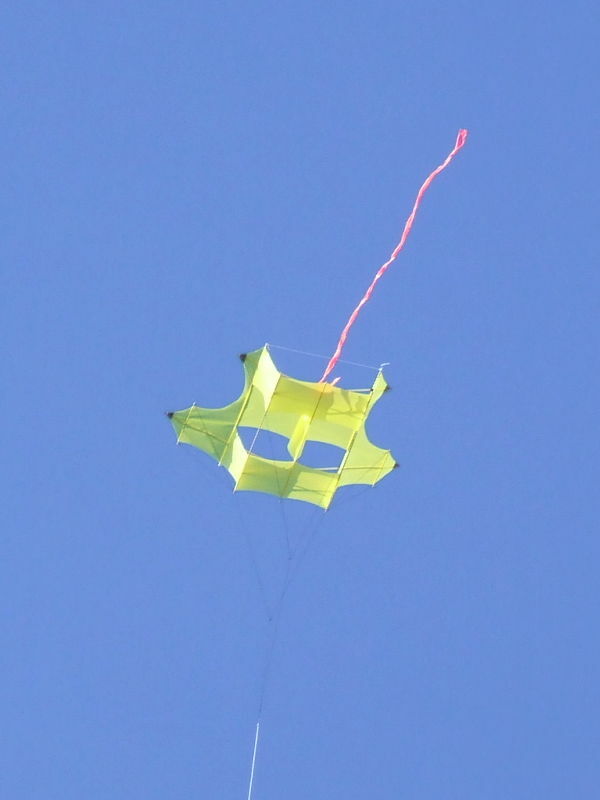 Unlike the original Cody kite, this particular version uses fabric that is cut out in a single piece. Someday I plan to make a larger one that is more like the traditional version. I relied mostly on the drawing prepared by Bill Wilson and the original drawing which Bill recovered from the Wayback Machine archive of VliegerBlad.nl. It's written in Dutch, but still quite useful. I hot-cut the fabric, so there was no need for edge binding or hemming on this small scale. The longerons are 1/8" (3.2 mm) hardwood dowels, and the four wing spars are 3/16" (4.8 mm) hardwood dowels. My next One-Piece Cody will use the recommended carbon fibre rods. April 18, 2009. First serious flight test. It did a lot of swooping back and forth, sometimes even looping around, especially when the flying line was short, say, 10 meters or less. I tied it to a corkscrew-type dog stake and did a long launch with about 30 meters of flying line and it went up right away. Adding this tail helped to settle it down somewhat. I intend to make a "fuzzy tail" for it, but the weather was too good to wait. 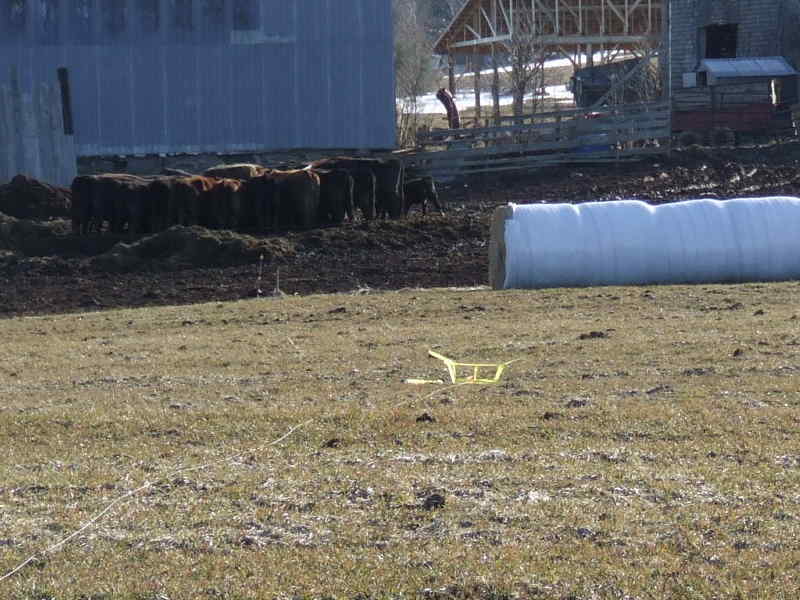 This tail is just a bit of surveyors' flagging tape I had in the napsack. Notice that this tail is not at all straight. It was during a lull in the wind. A view from downwind. Here you can see that the vertical panels in the middle cell separate a bit from each other. I'm not sure if that's a problem, but I might try taping the leading edges together, to see if sewing it closed is worthwhile. It was still oscillating a fair amount, so I added a bit of a drogue. Namely, the matching storage bag I made for the kite. It seemed to help some more, but the wind was changing from minute to minute so I couldn't really tell. I still have to replace the two tension lines that go across from one upper longeron to the other, leading end and trailng end (so the colours will match, of course) and at the same I may be able to find out if the frame is twisted or something and adjust it then. A short video, with the minimal tail. (15.6 MB, AVI format) You can see the oscillation. Unfortunately, the video with the carrying bag drogue turned out blurry. The wind was so light that you can hardly hear it. Instead, you mostly hear me breathing and the birds singing. One thing I was worried about was crash landings and damage to the 1/8" longerons. 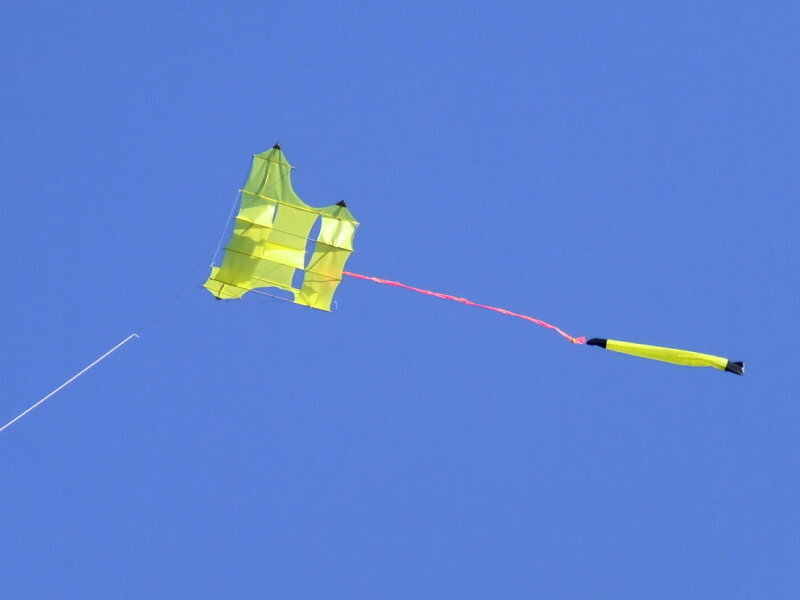 A few times today, the wind died right down, and the kite settled ever-so-gently to the ground, right-side up, like Armstrong landing the Eagle on the Moon. It was amazing to see. Before I put the bridle on I found that if you attach a small weight to the front wing spars where they cross each other, you can toss it like a glider. Next step: adding a fuzzy tail.